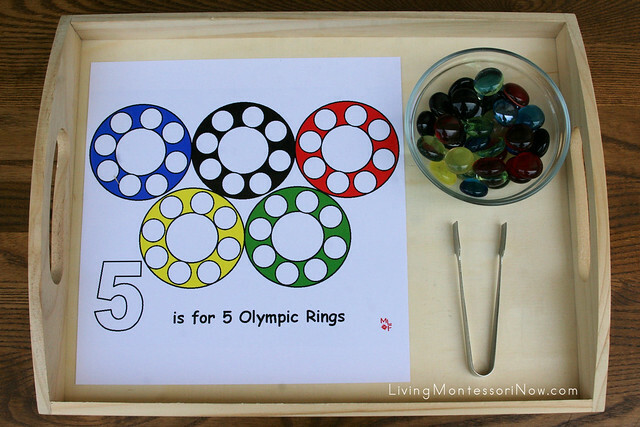 This activity used the 5 is for 5 Olympic Rings Magnet Page from Making Learning Fun. I love using glass gems. You’ll also see them in my Montessori-Inspired Beach Language Activities post here in May. I put the exact number of glass gems for each color in a glass bowl and added a sugar tong from Montessori Services. Instead of glass gems, you could use playdough balls, pom poms with a strawberry huller, magnetized pom poms or Power Magnets on a metal tray, or dot markers (if you don’t laminate the activity). In addition to emphasizing math and practical life skills, the activity can obviously be used to reinforce color names and sorting as well. 3 Dinosaurs has another HUGE free pack – Summer Olympics Pack for ages 2-7! The Summer Olympics Pack is even available for free in French! 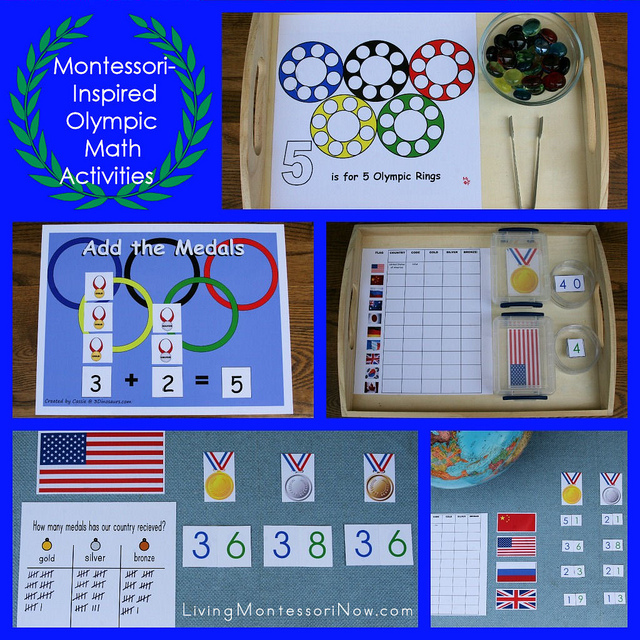 You’ll find many, many great activities in the Summer Olympics pack, including number puzzles 1-10, 11-20, 21-30, 31-40, and 41-50 as well as Count and Clip Cards for numbers through 20. There are also lots of wonderful printables in the pack that can be made into hands-on activities in other subject areas. 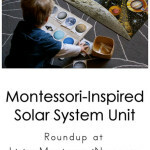 Some of those sorts of activities you’ll see in my Montessori-Inspired Ocean Math Activities last month as well as in activities I’ve posted at PreK + K Sharing in previous months. 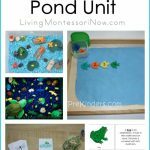 I had a One Fish, Two Fish Addition Tray in February with some presentation tips for addition activities. 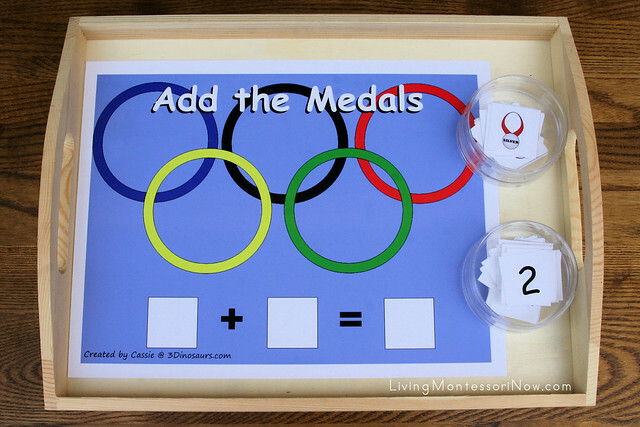 For this activity, I think it would be great to allow the child to create an addition problem using the medals and numerals. You could use a country’s medals for a particular day. For example, the child could add the gold medals won for the day to the silver medals to find the total number altogether. Then the child could add that number to the number of bronze medals for the day to find the team’s total metals for the day. 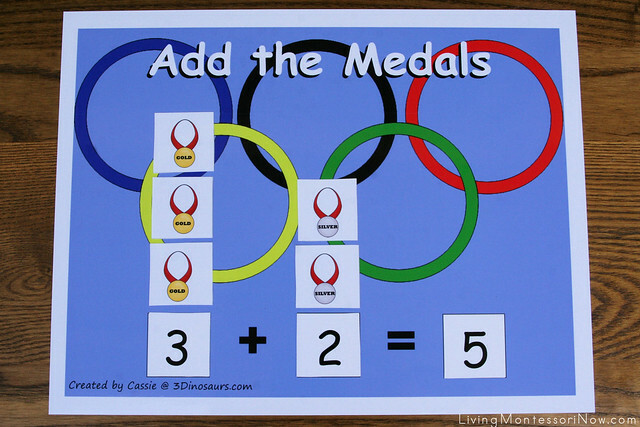 I adapted the Olympic Medal Chart from Activity Village for this activity. I used the free large size country flags and printable medals from Activity Village. I used an inexpensive wooden tray from a hobby store along with Really Useful Box containers as organizers. 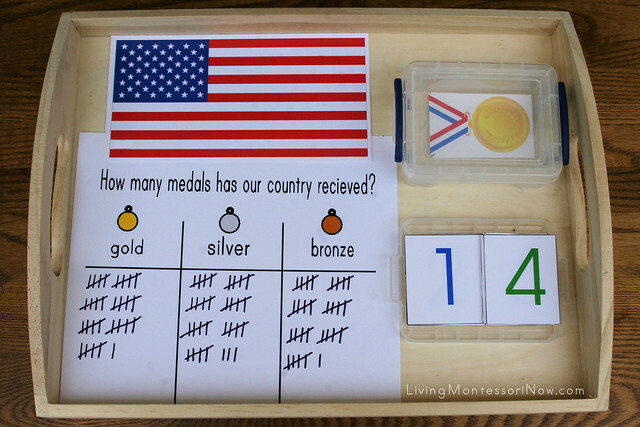 I used the free large number cards from Montessori Print Shop and tally sheet for How many medals has our country received? from Making Learning Fun. This works great for recording the medals your country receives throughout the 2012 Olympics. 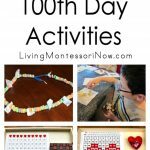 For children who are ready for them, the Montessori number cards are great to reinforce numbers with tens. The number in the photo is the number of medals the United States received in the 2008 Summer Olympics. Of course, you could use this to record any country’s medals during the Olympic Games. I recommend showing your child or students how to tally numbers. 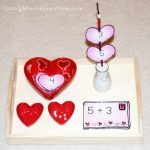 You can use craft sticks to create a hands-on tally activity as well. Children who are ready could create their own tally record. The Olympics are the perfect time to reinforce geography activities, too. 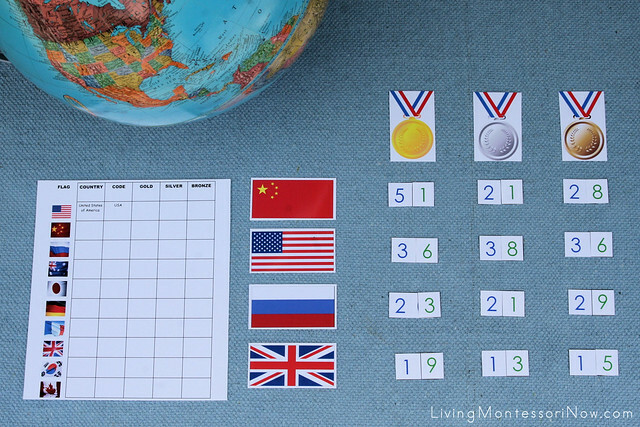 For this activity, I used the free medium size country flags and the same printable medals from Activity Village. Instead of using the free Montessori number cards, I downloaded the small number cards for only $0.99 from Montessori Print Shop. Printing and laminating the free large number cards for this activity would be significantly more expensive, since I printed out 5 copies of the number cards to have the correct number of cards for the numbers I used to represent the 2008 Olympics. 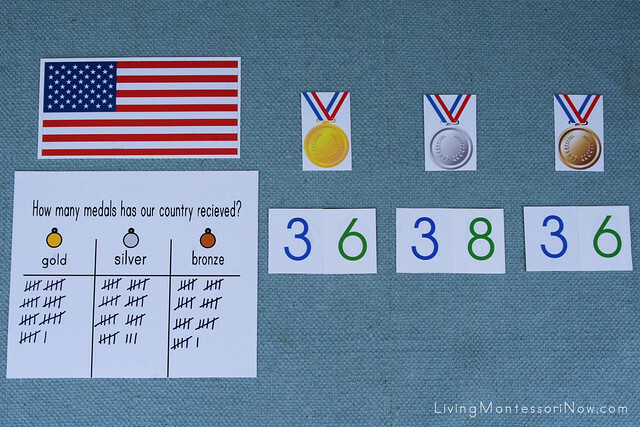 I printed and laminated the free Olympic Medal Count and Flag Worksheet from Printables4Kids. You could write the information with a permanent marker on a laminated page used as a control chart. I didn’t write the information out on the example chart in the photo, but I would for a school or homeschool. I used the 2008 Summer Olympics Medal Table from Wikipedia for reference. You could always have that chart available as well as the 2012 Olympics chart that you’d update daily throughout the Olympics (which would be interesting for comparison). I would make available a second laminated worksheet/chart with erasable markers for your child or students. If you have an extra table available, this could be an activity that remains set up throughout the Olympics. I added a globe to encourage the study of countries at the same time. You could have the activity set up for your own country or your country and one other country throughout the Olympics. At the end, you could lay out the activity as shown with countries receiving the most gold medals in the 2012 Olympics. This layout reflects the results of the 2008 Summer Olympics. 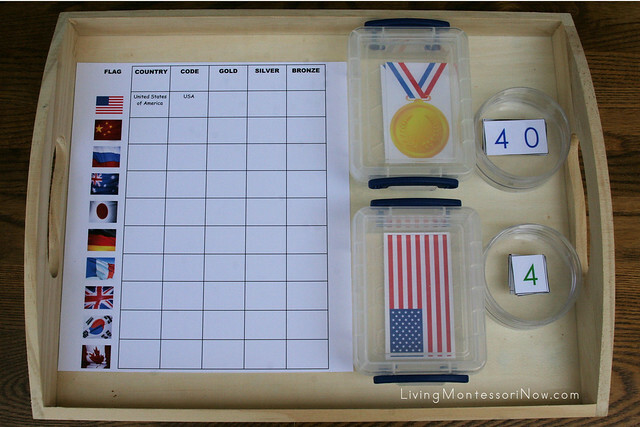 I didn’t fill in the worksheet, but you could have that complete at the end for your child or students to place the flags in 1-4 position (or however many flags you choose to use) according to number of gold medals. 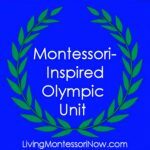 I also have an Olympic Unit Study Pinterest Board with links to many more wonderful free printables and activities of all types. Awesome! Thanks for sharing these! Thanks for your comment, Estella. I’m not sure what you’re asking. 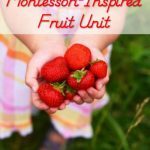 I am a certified Montessori teacher, although I’m just a Montessori writer now. Are you looking for teachers for your school or for Montessori training courses?